Okay...this is what a mailbox looks like at 5:30 am. The other picture is what a shoe and flashlight look like at 5:30 am. 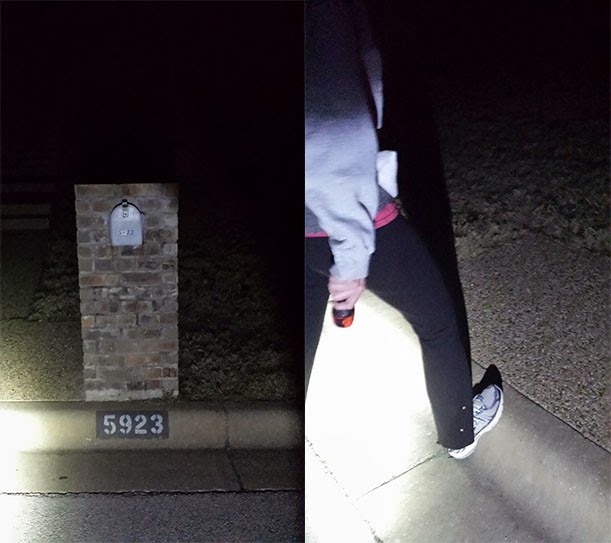 I am the luckiest person in the world because I have a neighbor and friend that will meet me at her mailbox 5 days a week at 5:30 am or 6:00 am and head out for a run in the dark. I know that sounds really hideous to many of you that are still snuggled under your blankets. We did not ever think about making this a ritual in our lives. It has sort of happened to us. It began in a very different way. We used to meet at the corner of the street every school day morning around 7:45 am. We did not do this with either of our first two children, but for the 3rd ones I think we started to feel a little softness in our hearts. Soft because we realized our babies were growing up and we had not been paying enough attention and it happened right under our noses...or soft because we realized if we let them leave we would be left alone in our houses with nothing to do but chores and work. So we started meeting at the bus stop when they were in Kindergarten. They are now 8th graders. I would sip my coffee in my running clothes deciding when I would actually commit to the pounding of my feet to the pavement..and one day I said, "Hey, Let's drop off our coffee mugs and head out for a run." Now I had been running daily since college and ONLY ran alone. So this was new for me. It was nice to have someone to chat with and discuss what was on our hearts and "to do" lists. So fast forward to the third-borns growing up...It became very uncool for us to be at the bus stop. And as both of our lives shifted our mornings looked different, we had to take older kids to high school, we had to get ourselves to work and our morning runs were fading. So, I think I came up with this great idea. Eileen, will you meet me early, in the dark and we can get our run done...She is the kindest person on the planet and she said, "yes." I have often thought she probably regrets that first "yes." But, we are now stuck in this silent commitment that is...wake up, throw on shoes and running clothes, grab a flashlight and meet me at the mailbox. We did not always meet at her mailbox. Mind you, we have been doing this for so long many things have happened to us as we pounded out what was on our hearts and minds. We have run through elementary drama, middle school drama, high school drama and now college drama. We have run each other through family members with long term illness, the sad loss of parents, the tragic loss of a sibling, the agony of cancer hitting our own friends, but we started meeting at the mailbox when my neighbor found a lump. I could not believe my healthy running friend could have this story. I was so relieved that it was dark and we were running when she told me. I did not have to hide the raw emotion on my face. We ran with tears in our eyes that day. And all along repeating over and over...you are going to be okay. So I decided, if she is brave enough to make it to her mailbox during her treatment we can walk, run, skip, or just sit there and stare at the moonlight and say a prayer. Well, that brave girl woke up and ran and meet me at her mailbox. She ran everyday. I forgot she was sick sometimes and on a treatment plan that was radiating her body and making her tired. So, we keep meeting at the mailbox. It is an amazing thing. If we miss a day it is okay. But, our backs will start aching, our sleep is not as good, we miss a few chapters of each others' lives. But, we get another morning to try again. I am the luckiest girl in my neighborhood because I have a friend that will meet me at her mailbox when it is early in the morning. Those morning moments have kept us healthy, happy and able to face the day. Thank you Eileen for your courage to say "yes", roll out of bed, tie your shoes, no matter what challenges you face. Your courage is amazing! Friend, Dog, and Good Grief!